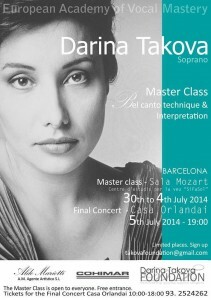 Master class of the bulgarian sopran Darina Takova in Barcelona from 30th June to 5th July. The Darina Takova Foundation is a non-profit organization dedicated to the help and support of young opera singers, enable them to pursue and achieve their career goals and to succeed on international opera stages. The Foundation is committed to the promotion of opera in general and to the creation of a new generation of dedicated performing artists. 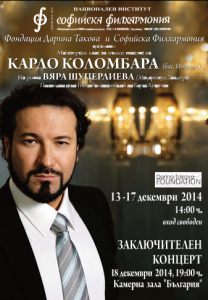 Under the guidance of Darina Takova, the Foundation will establish, organize and sponsor master classes, seminars, and summer programs in Bulgaria and abroad, as well as provide encouragement, training opportunities, career assistance and financial support, including scholarships and awards, to promising and talented young singers. Many of them will be the great singers of tomorrow, and it is with them that the future of opera resides. It is the goal of the Foundation to contribute actively to their success. Copyright © 2019 Darina Takova Foundation All Rights Reserved.